I have some really beautiful polishes to share with you all tonight. 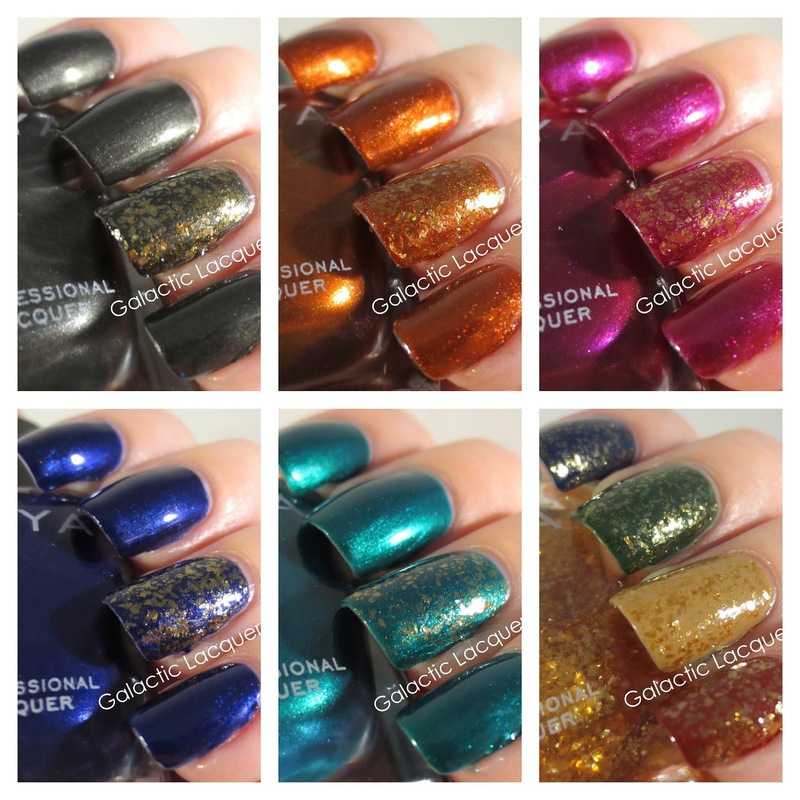 This collection is one of the fall 2013 collections that Zoya has released. I was really excited for the fall 2013 PixieDusts, but these are also amazing! Products sent for consideration. All opinions are my own. Claudine is a gorgeous dark metallic gray. I would almost call this a shade of gunmetal. It seemed a little streaky at first since the metallic bits left little lines where I had made the brushstrokes, but they evened out a little as it dried and looked even better with a layer of topcoat. I used two coats and got amazing coverage with it! I also used Maria-Luisa over it for an accent nail. Channing is a beautiful autumn orange. I think this color is perfect for fall since it reminds me of pumpkins and pumpkin spice! I used two coats of Channing and didn't really have an issue with streaks. I think it's because this one has little metallic flecks that help take away from whatever streaks you may have from application. I also used Maria-Luisa over it for an accent nail. Mason is an interesting color. I would describe this one as a metallic fuchsia with shimmer. It's very pigmented and covered very well in two coats. It's a little pinkish/cranberry colored, but the color doesn't exactly scream "fall" to me. Either way, it's a gorgeous color though! I also used Maria-Luisa over it for an accent nail. Neve is probably my favorite in this collection. It is an amazing sapphire blue that looks like it has depth to it. I applied two coats, but it's almost a one-coater. The color is absolutely stunning, and the little flecks in it shine light blue and red. You really just have to move it around under some light! I also used Maria-Luisa over it for an accent nail. Giovanna is probably my second favorite in this collection, though it's a toss up between this and Channing. For how light this color is, it is very pigmented and covers well in one coat, though I applied two just to be sure that it covered completely. I'm a big fan of blues and greens, so I really love this shade. Even though I have tons of blues and greens, this one is still unique to me! I would call it a metallic emerald aqua, as it looks light blue in some light, but also the bluish-green of emerald in other light. I also used Maria-Luisa over it for an accent nail. Maria-Luisa is the topcoat in this collection, so I applied it over the five other Satins above. However, I figured I would show it over some cremes so you could appreciate the shine of Maria-Luisa without a shimmer underneath. I applied it over four of the Zoya Fall 2013 Cashmeres: Sailor, Hunter, Flynn, and Pepper. You can see that it is gorgeous, and it's not really just a glitter topper. I consider this one to be almost like a flakie, as the gold flecks are like cellophane. The flecks really catch the light! I think this topcoat is amazing over shimmers or cremes and really looks great over deep blue. I applied one generous coat of Maria-Luisa over each color. In general, I am stunned by this collection! Zoya has done it again and has "wowed" me with their amazing colors. Honestly, all of these colors are beautiful and they applied wonderfully for me. Each one required two coats at most, as some could probably be worn fine with one good coat. I think Neve is my favorite, so here is a closeup of it with the light blue and red flecks in the light! You can purchase the Fall 2013 Satins collection from Zoya.com. Each full size bottle is $8. Gorgeous colours, they will be perfect in the winter especially with the glitter! What a beautiful collection, great swatches. Hot Days Hotter Nights Giveaway!